OWNERSHIP: Jointly by: FarmRail Systems, Inc., Transport Group and Genesee & Wyoming Industries, Inc.
Other frequencies licensed to the FGLK: 160.950, 161.220, 161.340. Trains carry cellular telephones. MP 17 to MP 26 class 1 track. MP 26 to 41 excepted track. MP 41 to end of track is out of service. GY1 - M-F Local work,may travel to ONCT and Waterloo as needed. ONCT as needed on Tuesdays. Usually will work to Lyons 4-5 days/week. GY2 - If needed to help out on heavy days. Often to do Guardian and Waterloo, Kendaia if needed. GC2 - 10:00 am Thursday to Canandaigua, works Phelps, ONCT as needed. GW2 - Mondays and Saturdays to Watkins Glen. Genereally ties up in Himrod on Saturdays to be there for Mondays switch. May run to Penn Yan if needed, then brings everything in on Tuesday. Subject to change though. Wednesday GW2 runs to move emptys from GY to Himrod, then to Penn Yan as needed, returning same day. GA2 - Runs about 3 days a week to Auburn and back to transfer cars. Occasionally the Solvay to Auburn Turn runs through to GY if they have a light day. Solvay to Auburn Turns - Run at least 5 days a week. Sat & Sun. they usually stay in Solvay to switch the paper mill and run over to the yard. Coal trains to Solvay are not scheduled as such, but run when they get them, usually on consecutive days with 40 and 45 cars. They bring back cars from the east also as they are available and time permits. Locos are used in different configurations and are never the same for too long. Recently they had two B23's and the 1801 as power on coal trains, leaving one B23-7 to handle the load to either Watkins or Canandaigua. We keep trying different things to utilize the B23-7's power to their advantage (unit reduction) on these jobs. Village of Phelps: on the East fringe of town on the large fill, and on the West side at the old Pennsy junction. Clifton Springs: just about anywhere is picturesque there! Shortsville: Standpipe Road, also if you can catch it in downtown at the 4 corners, they flag the crossing, and bring the train to a crawl until the power clears the intersection. Canandaigua: Near the old Lisk buildings on the East side of town, the power stops to run around the train, punching it through town....usually! INTERCHANGE POINT & RAILROAD: Wye at Lyons Yard with CSX - 5-6 times weekly, Geneva with NS - 5 times weekly, and Shortsville with the Ontario Central Railroad as needed (usually 1-2 times a week). LOCOMOTIVE ROSTER: Engines stored at yard in Geneva and Solvay - click on a link for a picture - some pictures mine, others used without permission and credit given to those photographers. 2. Click on "chatters" beside "Nightly Chat"
3. Register as new member or login. 4. Wait a minute while the chat room loads. 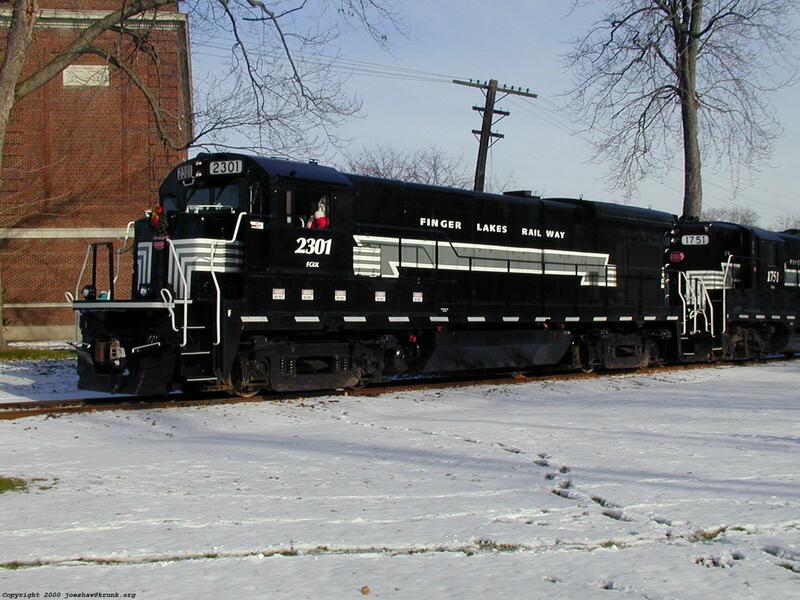 Finger Lakes Railway Corp. is a privately owned Class III common carrier serving a six-county region around Central New York's Finger Lakes. Acquired from Conrail in 1995, its three line segments and associated operating rights comprise a 140-mile system affording access to the national railroad network for more than two-dozen customers. FGLK's diversified traffic mix includes paper and paperboard, refined salt, processed foods, industrial sand, fabricated steel, scrap metal, crushed stone, chemicals, fuel, grain, flour, fertilizer, lumber and defense materiel. Consisting of the Geneva Cluster of lines when operated by Conrail, the Finger Lakes Railway serves the cities of Canandaigua, Shortsville, Waterloo, Geneva, Watkins Glen, Penn Yan, Auburn, Seneca Falls, and other points on the former Conrail Auburn Line. 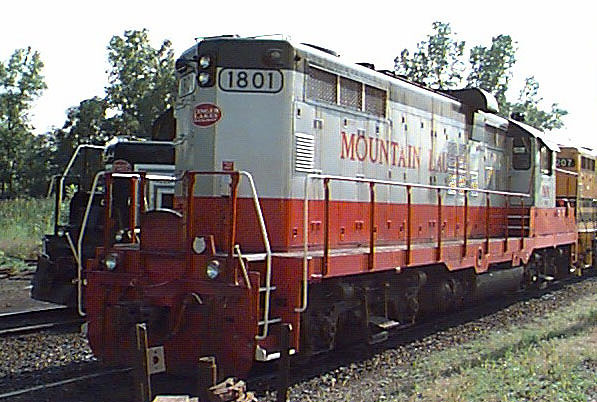 Since the FGLK started operations in July 1995 over 140 miles of former Conrail lines, the average monthly interchange has grown to 280 carloads - an increase of 63 percent and a total of 3,356 carloads a year. Carloads are running almost 10 percent ahead of the 1997 pace for the first two months of 1998. In addition, traffic has risen to 7,818 carloads in 1997, a 40 percent increase from 1994. The FGLK interchanges with Conrail in Geneva, and the Ontario Central (recently purchased by the Livonia, Avon and Lakeville) in Shortsville. 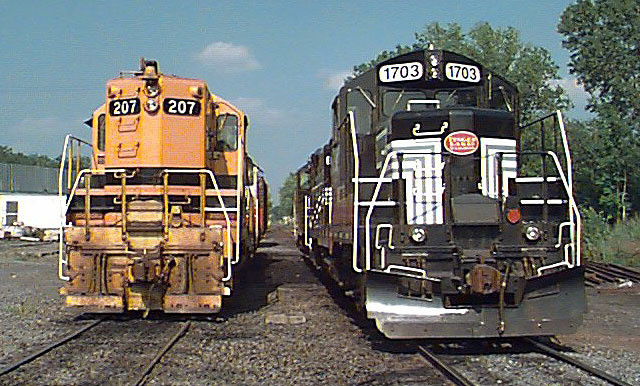 When the Conrail breakup is consummated in March, 1999 - the FGLK will interchange with Norfolk Southern in Geneva and CSX in either Lyons or Solvay. Also, there are plans to give NS trackage rights into Auburn for coal traffic. 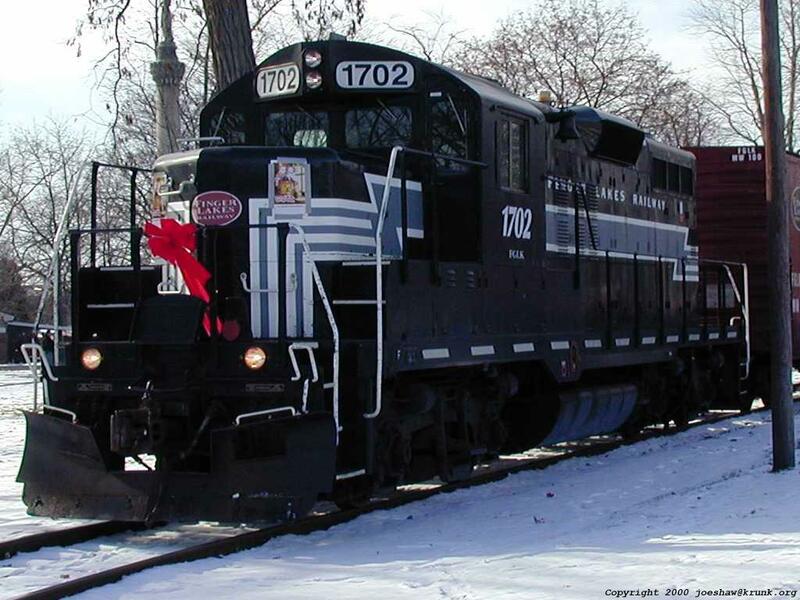 The Finger Lakes Railway resumed service to the Penn Yan with two tank cars of liquid Nitrogen for Yates Blodgett 12/16/98. The Penn Yan to Himrod portion of the former Pennsylvania Elmira Branch opened after nearly idle for two years. FLR had to use their own money upfront for a minimal tie replacement program. Then, the Yates County Industrial Developement Agency secured a $250,000 grant through the multi-modal transportation program with the help State Senator Randy Kuhl and Assembly Craig Doran. The railroad will now be reimbursed for repairs to the line. Steve Isaacs, Executive Director for YCIDA mentions future uses for the line. Citing lack of business along the line, Isaacs see Clearplass Container receiving raw materials of plastic pellets. Birkett Mills had to truck from Himrod - as well as Hall Fertilizer when the line closed. They would more direct service. FLR plans to run to Penn Yan once or twice a week depending service demands. In related news, FGLK plans to resume service to Seneca Falls for a new aluminum recycling plant. According to Finger Lakes Railway President Michael Smith, CSX, NS, and StL&H will start using the Corning Secondary to reach customers in Lyons and Auburn. FGLK currently runs trains as far east as the Baillie Lumber plant in Waterloo on the Auburn branch. Smith said NS wants to move cars to and from Auburn on a regular basis to include Auburn Steel and Owens Brockway. Plans call for trains of 10 to 30 cars to travel the entire length of the Auburn branch three nights a week, leaving Geneva between 6 & 8 pm. NS coal trains are now running in 45 car lengths from Geneva to Solvay with FGLK power. LYONS - Talks of an Amtrak passenger train stop in Lyons have been discussed for almost 10 years now; blueprints have been drawn up, state funding has been secured and Lyons residents and leaders have waited with their fingers crossed. But plans for the station have been derailed in the past, especially with the rejection of the project by Conrail, which owned the tracks that run along Franklin Street on Lyons' south side. On June 1, Conrail sold the tracks to two corporations, Norfolk Southern and CSX Transportation Inc., giving new hope to those pushing for the stop. But the project remained at a standstill through the summer. Now there is a new reason for train stop supporters to be optimistic. Mike Smith, president of Finger Lakes Railway, said his company is negotiating the purchase of the tracks from Norfolk Southern. And Smith says he's always been in favor of the train stop. "We view this stop as being an important asset for the region," he said. "The Finger Lakes is under-served as far as public transportation. This is a tough area to get in and out of." The proposed stop would be a small covered platform, similar to a bus stop, but would not sell tickets. Tickets instead would be purchased from Amtrak by phone or at a local travel agent, such as Globe Travel, less than a mile away. Proponents of the stop argue that it would provide a tourism boost in the area and a more convenient travel option for Finger Lakes residents, who now have to travel to Syracuse or Rochester to get aboard the train. "This isn't an issue for Lyons, New York - village or town," said Lyons Planning Board member Michael Santelli, who also owns Trombino's restaurant in Lyons. "This is a regional stop. This is a four-county area that has no rail links and very little in the way of bus service. This would be one of the few (passenger) train services that would link us to the rest of the state and the rest of the world." Santelli said he initiated the idea in 1990 while sitting in his restaurant with several friends, talking about the lack of transportation opportunities for Finger Lakes residents and tourists. In 1993, a Rochester-based architectural firm volunteered to draw up some blueprints free of charge. The next year, Lyons town Supervisor James Fabino - a strong station advocate - and state Sen. Michael Nozzolio, R-53 of Fayette, successfully lobbied the state Department of Transportation for a $250,000 grant to build the station and passenger platform. The idea was put on hold, however, when Conrail wouldn't allow Amtrak passengers to cross a secondary track to the south of the proposed station. Conrail wanted the secondary tracks moved or a pedestrian overpass built, both of which would have been costly. "As usual, it was a liability issue," said Smith, whose company is a short-line railroad that operates over 150 miles of track in the Finger Lakes region. "Their basic position is to say no. We, on the other hand, are more tied to our community." If Smith's company buys the tracks and the station is built, he said he would allow pedestrians to cross the tracks on a ground-level crossing. "We're going to be very cooperative with the folks in Lyons to minimize the expense associated with station construction," Smith said. The $250,000 DOT grant has been rolled over into each year's state budget since the project was turned down in 1994. But Fabino and Santelli worry that those funds will be lost if the train stop does not get going soon. "I'm afraid if this thing doesn't take a positive direction in the next year or two, we're going to lose that money," Santelli said. To get the project on track, Santelli and Fabino are looking for backing from municipal, business and school leaders in the region. So far, there has been a strong sentiment of support, especially in the business community. "If something stimulates the local economy and we wind up with more people in the area seeking employment - that is good for us," said Robert Proseus, human resources manager at Parker Hannifin in Lyons. Hobart and William Smith Colleges history professor and transportation analyst Clifton Hood said the train stop could provide a momentary "shot in the arm" for tourism and the economy in the area. But he also said high-speed trains could revolutionize upstate New York. "I understand it and I think they have a case to be made," Hood said. "But I those people don't lose sight of the larger issue: Faster regional transportation, which, I think, is the future of the area." Santelli said the state DOT has made high-speed trains a priority in recent years. But in order to have high-speed trains, passenger lines like Amtrak need fewer stops. That is a good reason why businesses, schools and local leaders should write letters supporting the Lyons train station to the state DOT commissioner, Santelli said. "We're still going to be part of the larger state DOT budget and I think they need to be convinced of the validity," he said. FGLK employment has grown from 10 during its 1994 start up to the current 24. The railroad plans to hire another 6-12 employees in anticipation of increased traffic. Railway officials say more is expected, with carloads jumping from 5600 to 9000 annually. More FGLK news: The FGLK will be acquiring approximately 40 miles of track inside the former Seneca Army Depot. There has been interest in companies building here and utilizing rail access. Once Conrail is finally carved up on June 1st, FGLK will gain trackage rights from Geneva to Lyons and interchange with CSX there. They plan on using both branches of the "Y" and are trying to get the two connected across the top to avoid the main. Local customers between Geneva and Lyons will be handled by the FGLK as NS doesn't want to handle local traffic that far north. NS will interchange in Geneva three times a week. The train will come up one day, park, then return to Gang Mills the next day. The Watkins Glen line is to be extended almost a mile to handle a new customer as well as a daily stone train from Oaks corners for the Southern Tier. Courtesy Alan Larsson - 4/19/99. Be sure to check out Carter Garrigues-Cortelyou's unofficial Finger Lakes Railway page at http://fglk.railfan.net as well. This excellent web page is one of the few good places on the internet dedicated solely to a single shortline railroad. Here you will find pictures, locomotive rosters and a listing of online customers. Rather than duplicate his efforts, surf over to his page and see for yourself! Carter Garrigues-Cortelyou was kind enough to send me a transcript of a lecture on the history of railroading in Geneva. Click here to view the document. HISTORY: The Solvay-Canandaigua line is part of the former Auburn Road of the NYC. The Kendaia branch is a short segment of the former Lehigh Valley mainline to Buffalo. The Watkins Glen line is former Northern Central / Pennsylvania RR trackage. More on the history of railroading in Geneva can be found by clicking here. 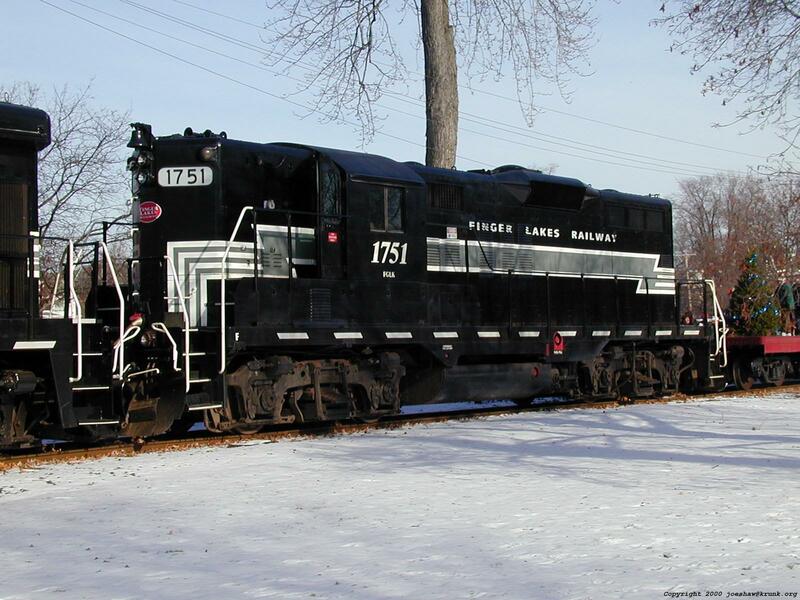 The Finger Lakes Railway began operations on July 22, 1995 on former Conrail trackage known as the Geneva Cluster.